The captive portal is an essential element of a carrier Wi-Fi or venue-specific Wi-Fi deployment. The captive portal provides a landing page for new subscribers, and manages WISPr capabilities for automated access/authentication. A capative portal is the front door of the Wi-Fi offer, enabling new subscriber sign-ups, settlement/payment services, and affinity/advertising functions. 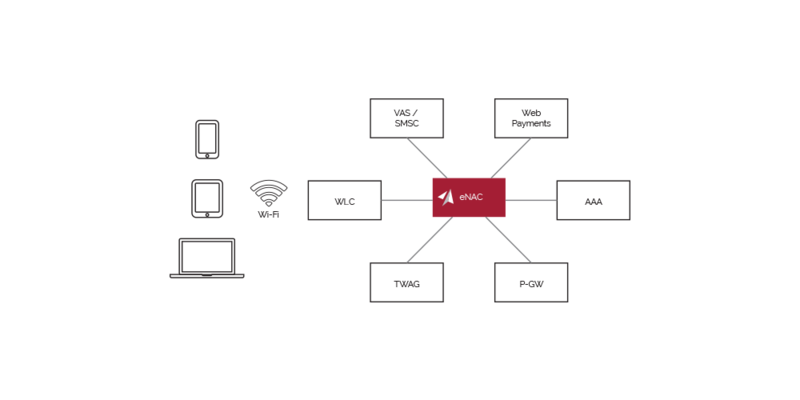 Built on Accuris server carrier-class platform, Accuris' enhanced Network Access Controller (eNAC) supports key carrier Wi-Fi service capabilities, to allow wireless and broadband service providers to deliver a managed Wi-Fi experience to new and existing subscribers. eNAC supports WFA Passpoint™ and WBA Next-Generation Hotspot (NGH), and WISPr 1.0 and WISPr 1+.